The Daytona Beach / New Smyrna area features some of the best ocean fishing found anywhere. Blue Marlin are found in the Gulf Stream. Closer to shore, Sailfish, Dolphin, King Mackerel, Wahoo and Tuna are caught on trolled baits. On the bottom around the numerous reefs, Grouper and Red Snapper are the most avidly sought species. 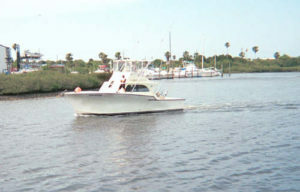 You can charter a boat from the docks at Ponce Inlet.